We are glad to release the 14th edition of Ekaakshara- The official e-magazine of L&D Global. This is a quarterly theme based magazine. 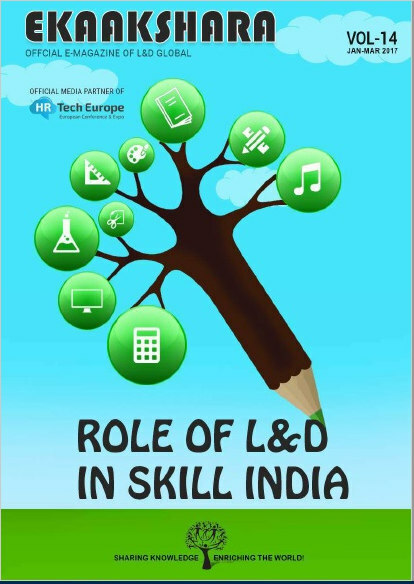 The theme of this edition is ‘Role of L&D in Skill Mission India’. To handle the skill gap that’s hovering over the economic development of the country, PM Narendra Modi had launched Skill India Initiative in 2015 to train about 400 million people by 2022. The project seems ambitious and the recent approval of Rs 12,000 crore by the Cabinet shows that the Government is taking serious steps to bridge the gap of supply and demand of talent. The technological evolution that is sweeping the entire corporate sector introduces new skills every day, and to keep up with the newer skill sets it has become essential for the Government and the industry to come together to find the perfect solution. This edition reads the views of L&D professionals on how this vertical can help the Government achieve this vision. Kindly let us know your view points after reading. We will post the five best comments in our next edition.